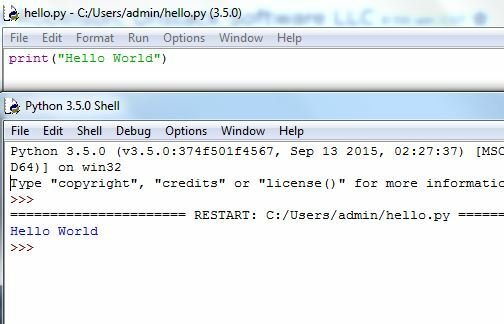 To access the Python shell, open the terminal of your operating system and then type "python". Press the enter key and the Python shell will appear. This is the same Python executable you use to execute scripts, which comes installed by default on Mac and Unix-based operating systems. The above example also demonstrates how we can run multiple Python statements in interactive mode. The two print statements have been indented using four spaces. Just like in script mode, if you don't indent properly you will get an error. Also, to get the output after the last print statement, you should press the enter key twice without typing anything. To exit help, type q for "quit" and then hit the enter key. You will be taken back to the Python shell. It's very tedious to run long pieces of code. If you need to write a long piece of Python code or your Python script spans multiple files, interactive mode is not recommended. Script mode is the way to go in such cases. In script mode, You write your code in a text file then save it with a .py extension which stands for "Python". Note that you can use any text editor for this, including Sublime, Atom, notepad++, etc. 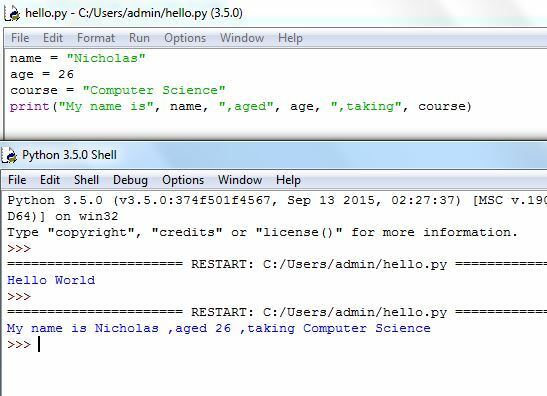 If you are in the standard Python shell, you can click "File" then choose "New" or simply hit "Ctrl + N" on your keyboard to open a blank script in which you can write your code. You can then press "Ctrl + S" to save it. After writing your code, you can run it by clicking "Run" then "Run Module" or simply press F5. Open the terminal of your operating system then navigate to the location of the file. Of course, you will use the "cd (change directory)" command for this.